This spectacular 18K white gold estate pin features a dazzling square cut diamond at its center. Intricate milgrain and additional fine faceted diamonds are set into the floral inspired pin. 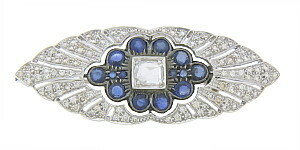 Fabulous round cut sapphires surround the center diamond. The pin measures 2 1/4"in length, 7/8"wide. Circa: 1900.